Laser Vision Correction is an outpatient procedure that is capable of correcting a wide range of nearsightedness (myopia), farsightedness (hyperopia) and astigmatism. LASIK is the acronym which stands for Laser Assisted in-Situ Keratomileusis. LASIK was first performed in clinical trials in the U.S. in 1991. The term refers to the use of a laser to reshape the cornea without invading the neighboring cell layers. 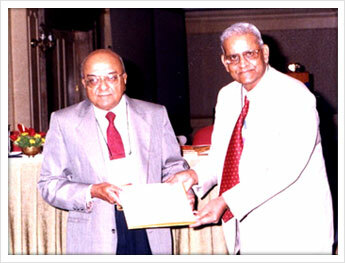 Now it has expanded to other methods of Laser vision correction (LVC) as well. Laser vision correction has fast become the most preferred procedure for the treatment of myopia, hyperopia and astigmatism. The procedure is safe and the visual recovery is rapid which is why patients are undergoing this procedure the world over. 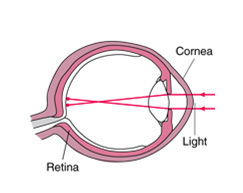 Normally, the rays of light entering the eye are brought to a precise focus on the retina – the light sensitive layer lining the back of the eye. When such a focus is not achieved, a refractive error results and vision is not clear. These imperfections in the focusing power of the eye are called refractive errors. A myopic eye is longer than normal or has a cornea that is too steep, as a result of which the light rays focus in front of the retina. Close objects look clear, but distant objects appear blurred. 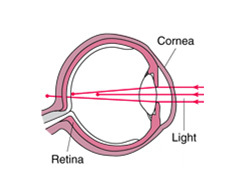 Astigmatism (cylindrical error) occurs when the incoming light rays are unable to reach a common focus within the eye. Astigmatism distorts or blurs vision for both near and far objects. 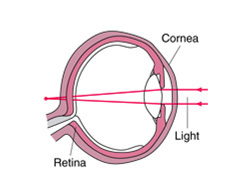 The cornea is the clear front window of the eye. When you have astigmatism, the cornea curves more in one direction than in the other, like a rugby ball. It is possible to have astigmatism in combination with myopia or hyperopia. 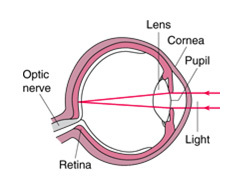 What are the options to correct Refractive Error? There are several alternatives to correct your vision. Spectacles or contact lenses are the most common methods of correcting refractive errors. Refractive surgery is also an option to correct or improve your vision. These surgical procedures are used to adjust your eye’s focusing ability by reshaping the cornea, or front surface of your eye. 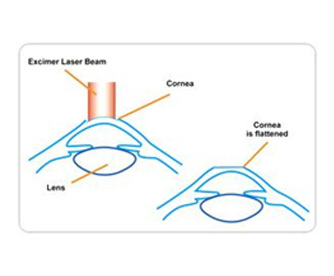 What is Laser vision correction surgery? 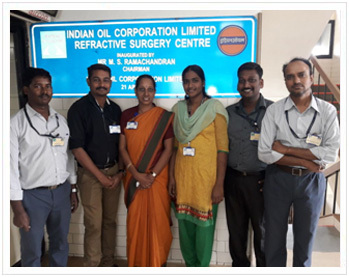 Refractive surgery is a procedure intended to reduce a person’s dependence on glasses or contact lenses by reshaping the cornea to enable light entering the eye to be properly focused onto the retina for clearer vision. 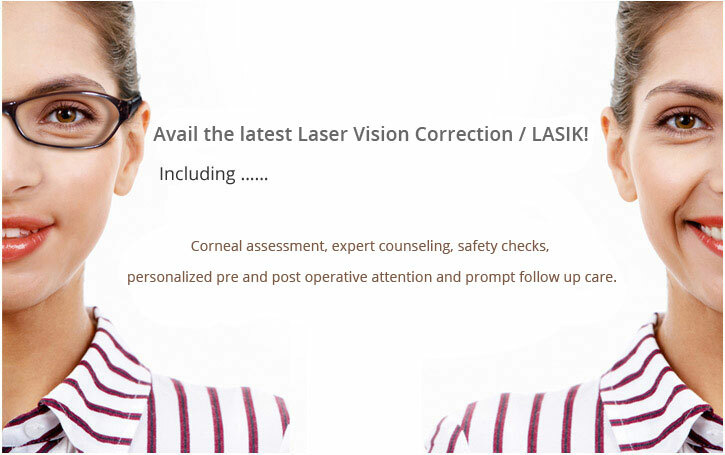 What is the type of Laser vision correction surgery available? It is a surgical procedure intended to reduce a person's dependence on spectacles or contact lenses. In this procedure a thin hinged flap of cornea (the cornea is the transparent, dome-shaped window covering the front of the eye) is created and lifted to one side to access the underlying cornea (called the stroma) and remove some corneal tissue using an excimer laser. The flap is then repositioned in its original position. Femtosecond lasers allow for customization of the flap for each patient. In addition to producing reliable flap thicknesses, the flap diameter can be selected to one-tenth of a millimeter. Femtosecond lasers are (state-of-the-art) instruments that offer more surgical precision than current manual techniques. It was the original kind and is still sometimes used. It involves gently scraping the surface layer off the cornea and then using a laser beam to re-shape it. It is a procedure, which combines the advantages of PRK and LASIK, Epilasik involves the use of an epikeratome, only the superficial epithelial layer of cornea. Fig 6: Epi LASIK involves lifting just the skin (epithelium) of the cornea. It is also referred to as custom LASIK or wave front LASIK, is similar to conventional LASIK, except that in addition to treating a patient’s basic refractive error, specific distortion in a patient’s eye (high order aberrations) can also be treated. Our LASIK consultant / counselor will have detailed discussion about the appropriate procedure based on the eye measurements, glass power and refractive surgery safety tests preoperatively. Who are eligible candidates for corneal refractive surgery? Be atleast 18 years of age, with a stable refraction for the past 1 year. All other Parameters in the eye being reasonably normal. Normal pre-operative refractive surgery safety tests. Should not have any connective tissue diseases (rheumatoid arthritis), auto immune (SLE) and immunodeficiency diseases (AIDS). Should not be pregnant or a nursing mother. What is the procedure and follow up? Please remember that if you are a contact lens wearer you have to discontinue the use of the same atleast 2 weeks prior to your Lasik consultation (As the contact lens can alter the shape of the cornea). During this period you can wear spectacles. As a part of Comprehensive Eye examination for Lasik, we dilate your pupils for retinal evaluation, since we dilate the pupils, we request you to have someone accompanying you to drive you back as you will not be able to self-drive. This is because the vision is slightly fuzzy for an hour or two. Hence avoid going back to office work after the evaluation is completed. The primary objective of this consultation is to determine whether you are a suitable candidate for laser vision correction (LASIK), and if so, which procedure is most appropriate for you. The treatments we apply are customized for the person’s needs, age and glass power of eye to give a precise result. Lasik information brochure giving details of our treatment procedures is available at the LASIK reception desk. Our LASIK Secretary will provide you an Outpatient information sheet to be filled for your medical record. Kindly complete all applicable details in capital letters, then you will be given a hospital MRD number mentioned Identity Card along with LASIK visiting card. Your eyes will be dilated with eye drops. You will be asked to keep your eyes closed for a brief period of time to aid the dilation. During the consultation with your Refractive Surgeon, the pros and cons of different types of refractive procedure will be discussed and the choice of procedure will be decided based on the tests. Your counselor will explain in detail the most appropriate process, cost involved, and finalize the same with your concurrence. Appointment for the LASIK procedure, fee structure and payment procedure will be explained by our LASIK clinic receptionist. You should plan on being at the LASIK Wing approximately 1 to 2 hours prior on the day of your procedure. Please be accompanied by an attendant. Do not drive by yourself after your treatment. When you arrive at our LASIK Center, on the day of your procedure, you will complete a brief check-in process (if any repeated tests). You will be asked to sign your consent forms prior to the procedure. We want you to be as comfortable and relaxed as possible. Our attentive staff will be on hand to cater to your needs and to keep you informed and comfortable through every step of the process. You will also meet with our refractive surgeon prior to your procedure, and we will recheck any measurements necessary to ensure your eyes stability. Before the procedure begins, numbing eye drops will be applied to prevent any discomfort during the procedure. Your eyes will be positioned under the laser and the instrument called the lid speculum will be used to keep the eyelids open. 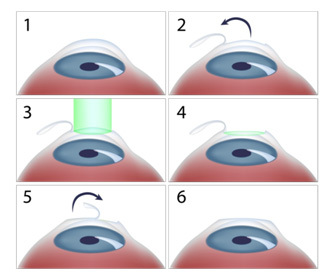 Based on the type of refractive procedure the surgeon will create the flap or the bed for the laser. After creating the flap, the surgeon will then adjust the eyes to align with the laser. You will be asked to look at a green target light for a short while as the laser sends pulses of light to your cornea. You will also hear a sound while the laser is operating. Lasik will be performed on each eye separately starting with the right eye followed by the left eye in the same sitting. Once the procedure is done, the surgeon takes a look at your eyes through the slit lamp. Post LASIK instructions will be given by our LASIK OT staff. After resting for a short period of time you will be able to go home. Patients coming from a long distance / outstation can have these checkups with their local eye specialist and send the follow up report in a prescribed format (you can collect from our secretary / down load it from our website) to us by letter / mail (lasik@snmail.org ) or fax (044 28254180). Instillation of eye drops as per the prescriptions. Can have below neck bath from the following day. Do not expose your eyes to dust / pollution. Do not touch or rub your eyes. Do not take head bath or splash water into the eye and face for 2 weeks. Do not keep your eyes open for long duration. Do not clean the eye on the day of your treatment. Do not swim for one month. Do not use eye cosmetic /eyeliner for 2 month. Avoid exercises for 1 week. Avoid self-driving for 1 week. There is a possibility that you may still need spectacles or contact lenses to attain good vision following the treatment. Patient may have light sensitivity, halos, dryness and glare after the refractive surgery. Very rarely severe complications during or after corneal refractive surgeries (eg. flap problems, infections etc.) and can result in a need for extensive treatment. There are some alternatives to correct your vision. Eyeglasses or contact lenses are the most common methods of correcting refractive errors. The other option to correct your vision is called ICL (implantable contact Lens), When laser refractive surgery is contraindicated, ICL is a kind of lens which is implanted into the eye and does not require frequent removal like a normal contact lens. With years of experiences and excellent technology, we have been successful in carrying out Refractive Surgery treatment for shortsightedness, farsightedness, and astigmatism. The new Wavefront Technology (using the Wave Light Allegretto Excimer laser Machine) allows us to treat a range of myopia, hyperopia, and astigmatism. A well-experienced Refractive Surgery team, combined with state-of-the-art technology and our quality Protocols ensures you have an unmatched edge over other centers. Over 20,000 Refractive surgeries (LASIK) have been performed so far. Versatile Range of Treatments: - We have treated spherical numbers as high as -12 D and + 6 D as well as astigmatism as high as 6 D with excellent results. The extent to which an eye can be corrected is determined by our refractive surgeon after pre-procedure evaluation. Allegretto eye q 500 is also the fastest LASIK machine in the world, which means the shortest treatment time, lesser strain, better comfort and the least chance of error. The fast eye trackers will ON/OFF the laser if there is any accidental eye movement making treatment extremely safe. 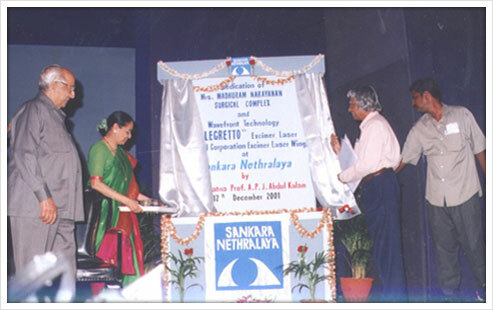 What are the benefits of Laser Vision Correction care at Sankara Nethralaya? Femtosecond laser delivers precise, predictable outcomes and a comfortable surgical experience. Clearing the pre & post op queries through helpline numbers and e-mail. Counseling the patient during consultation. Credit Cards – All Credit Cards are accepted. 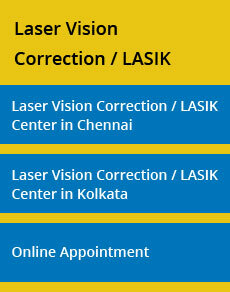 How to plan your Laser Vision Correction at SN in many easy ways? Please feel free to email us with your queries and we would be happy to clarify them. Laser Vision Correction / LASIK will be performed on Mondays / Wednesdays & Fridays for scheduled candidates. We look forward to your joining Sankara Nethralaya’s family of happy and satisfied Laser Vision Correction / LASIK candidates. I wanted to jot down my thoughts and thank a few people when my memory is still afresh. Overall, I'm happy with the entire procedure though my vision is yet to fully recover. I'm hoping that someone reading this will take the time to share and thank those mentioned in this mail. First of all, big thanks to Subha Jaya who was my first point of contact. When I noticed the online appointment link was broken, I wasn't sure if I could squeeze in the surgery during my vacation. But she understood my situation and found a open slot. In all her interactions (both with me and other patients), I could observe warmth and concern which I think is crucial for someone who is the front-face of any organization. During all the assessment and safety tests, Deepa (whose name I'm not really sure because my eyes were blurred) was kind enough to explain all the tests and also answer all my curiosity questions. I appreciate her cheerful, friendly persona and unhurried explanations. Another person whom I was impressed with was Lakshman who had a humble persona patiently explaining post-op drops administration. Though he had to explain the same thing to multiple patients, I didn't notice any annoyances or change in tone. Samba Sivan who was at the counter also helped me with useful information regarding costs and appointments. This is A.K from Ambattur, Chennai. I have undergone Epi-Lasik Surgery at JKCN Sankara Nethralaya on 16.09.2016 (MRD No.2843088). I was using Spectacles for almost 12 yrs since from 2004 and I decided to do Laser Treatment in SankaraNethralaya, Obviously India's Best Eye Care. I really appreciate the treatment, consultation, registration process and more importantly the Service. I was happy with the way the Doctor's explaining the things Clearly and also with Medical Facilities and Latest Technological Equipment's using here. It was great indeed. Dr.Geetha Krishnan did the surgery and now I am completely alright. I got my Clear Vision Back.